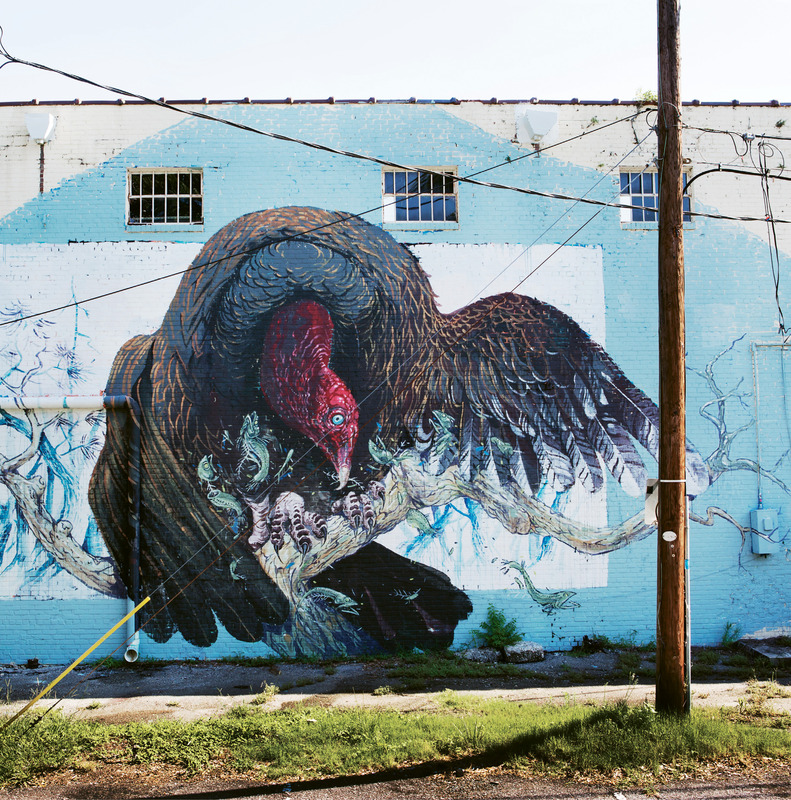 Turkey Vulture by Hitnes August 2015 on Alycia Alley behind Children’s Cancer Society Thrift Store (835 Savannah Hwy.) 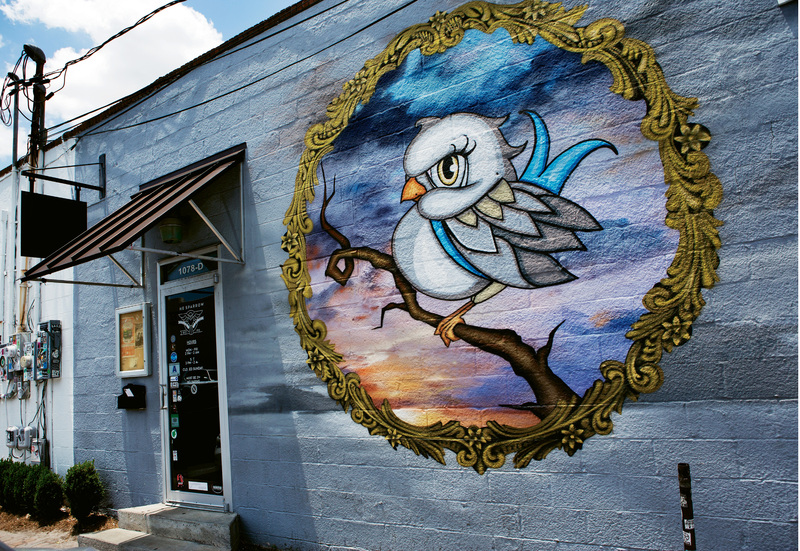 working with ChART (Charleston Art) outdoor initiative & gallery and enough pie, the Italian muralist produced this work during his journey across the U.S. retracing the steps of John J. Audubon. 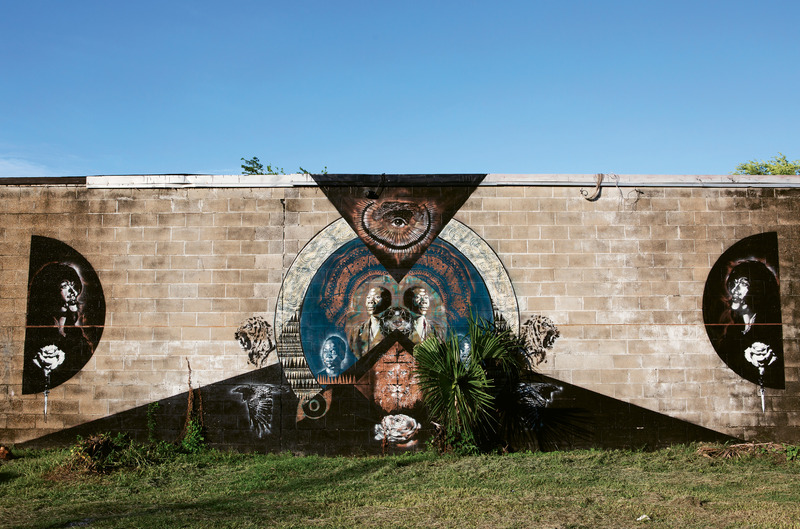 Untitled by Sarah Staub December 2012 on Alycia Alley on the side of Children’s Cancer Society Thrift Store (835 Savannah Hwy.) 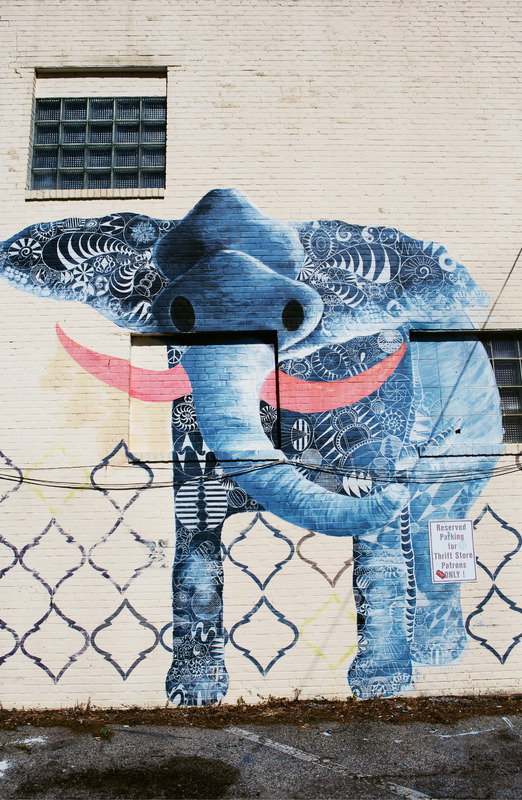 It’s among the now more than two dozen ChART murals in the outdoor gallery first established in 2011 to “provide public outdoor space for artists to paint, play, and create.” Chart founder Geoff Richardson says the red tusks reference the ivory trade. 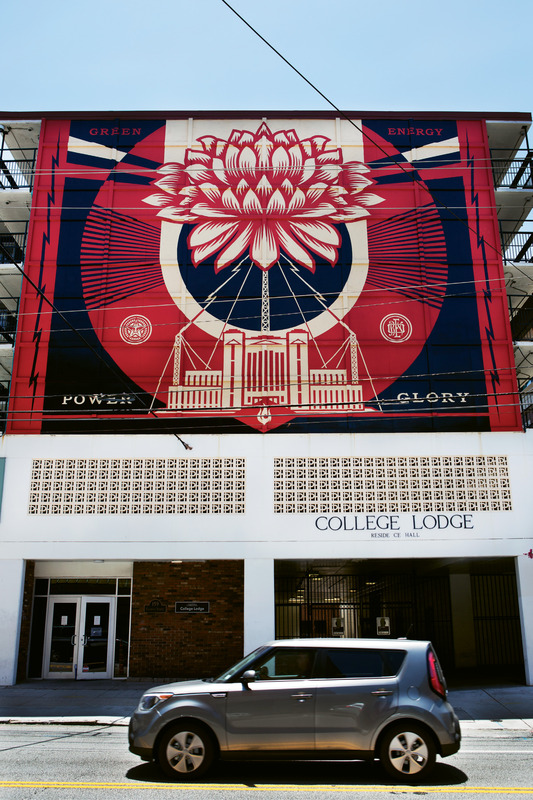 In Remembrance by Tripp Derrick Barnes May 2016 Redux Contemporary Art Center (136 St. Philip St.) Working with a team of artists, the Columbia native painted this mural in his “PopNeoism” style to honor the Rev. Clementa Pinckney and the Emanuel AME church parishioners killed during Bible study on June 17, 2015. 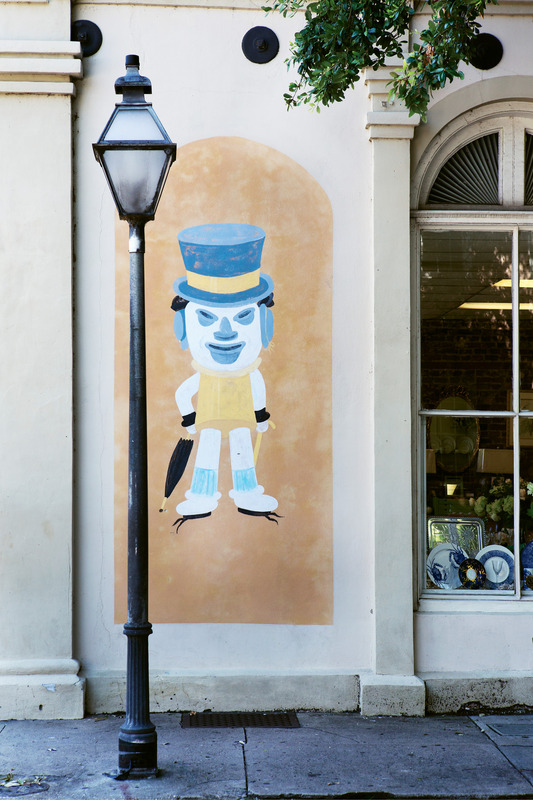 The Hat Man Artist Unknown 1892 Broad & Church Streets composed of 16 different hats of 12 different styles, The 19th-century mural served as the original signage for Plenge's Haberdashery. 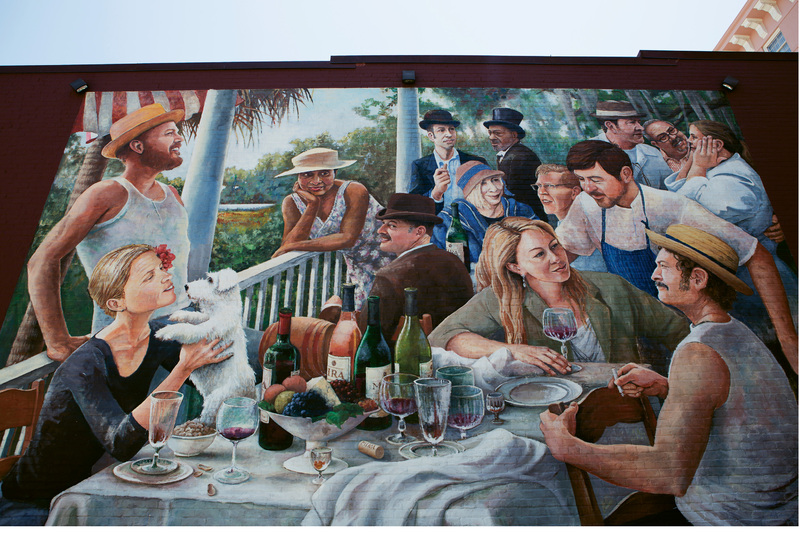 Renoir Redux: Exceptional Pairings by David Boatwright July 2014 Mira Winery (68½ Queen St.) When tasked with conceptualizing a noncommercial for the Napa Valley Winery's tasting room in downtown Charleston, Thee prolific artist and muralist created what Mira Winery proprietor Jim Dyke Jr. calls “Charleston’s version of Mount Rushmore.” Among the local F&B faces are chefs Mike Lata, Frank Lee, Robert Stehling, and Michelle Weaver, as well as Grand Dame Nathalie Dupree and Charleston Grill icon Mickey Bakst. 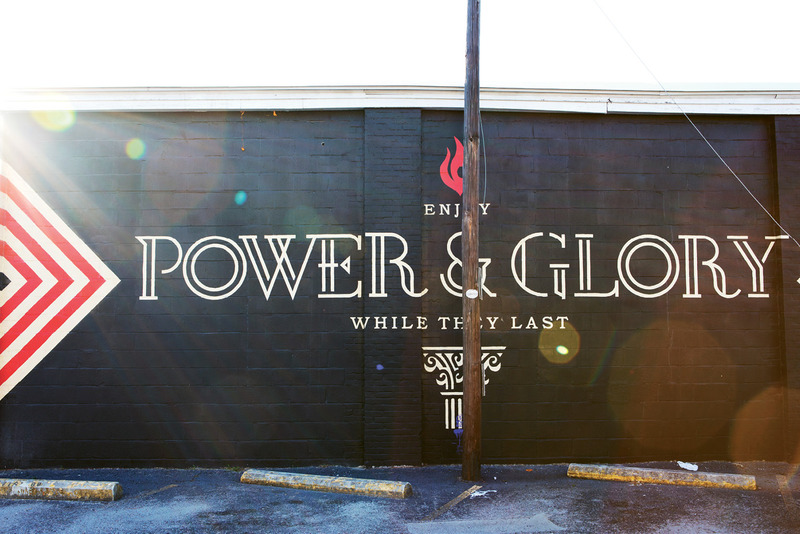 Power & Glory by Shepard Fairey May 2014 - Across the driveway from The Daily and High Wire Distilling Co. (656 King St.). 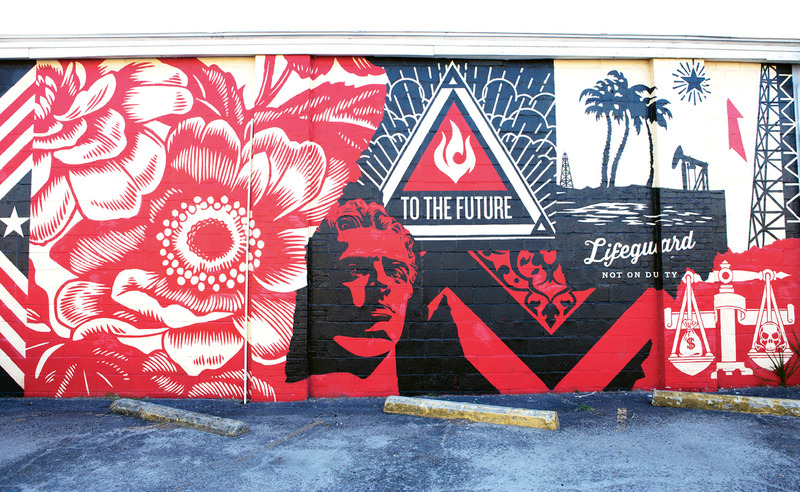 In conjunction with his 2014 Halsey Institute of Contemporary Art show, “The Insistent Image: Recurring Motifs in the Art of Shepard Fairey and Jasper Johns,” the Charleston native and artist of “Andre the Giant has a posse” and “Obey” fame received permission to install a series of large-scale public murals on private buildings downtown. 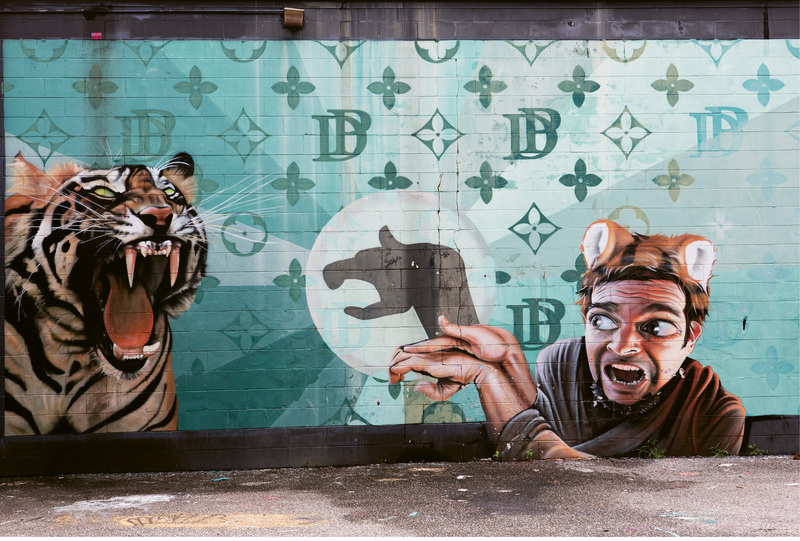 Redd Foxx (OPPOSITE) By Sean Williams Fall 2015 4845 Chateau ave. 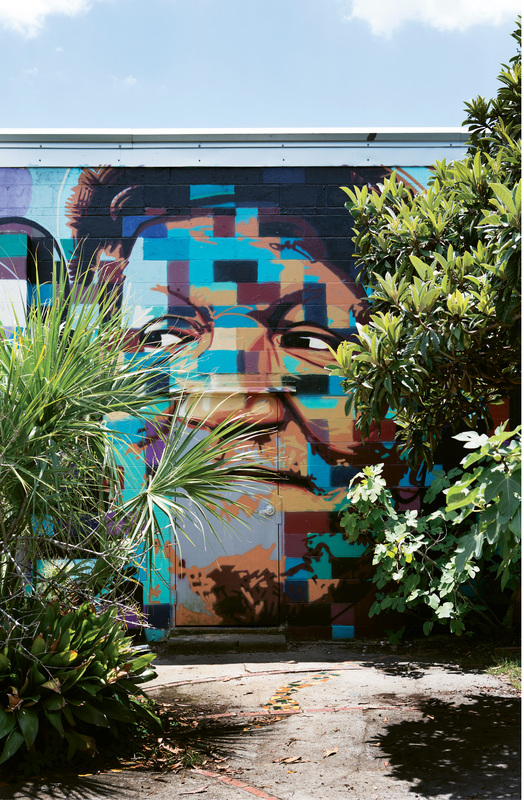 The local artist, muralist, and metalsmith painted this homage to the comedian and star of the 1970s sitcom Sanford and Son on the studio he shares with Patch Whiskey. The PlayHouse by Patch Whisky 2015 Spoleto Festival Scene Shop (1553 King St. Ext.) 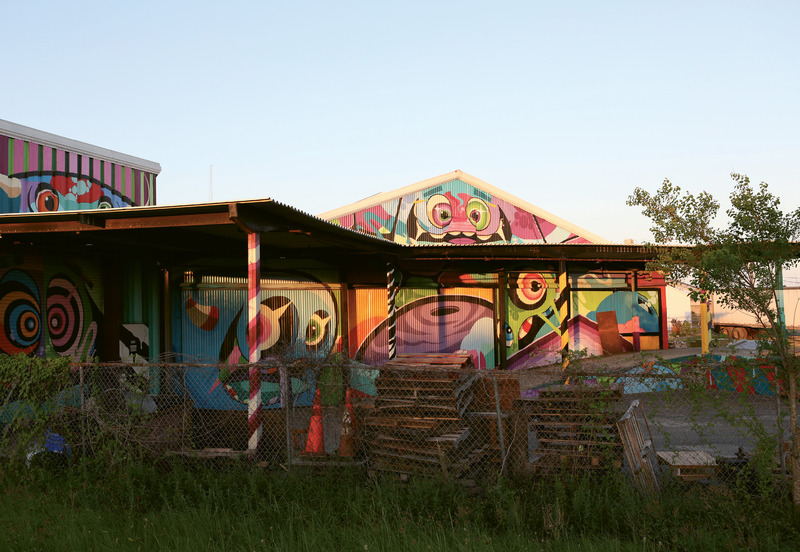 When Spoleto festival USA renovated its plain corrugated metal workshop, the powers that be made the apt decision to hire the local artist and muralist to make the exterior “a magnificently muraled piece of art.” visible from I-26, it’s covered in Whisky’s brilliant and comical “rainbow monsters,” which can also be found on buildings throughout the area and up and down the east coast. 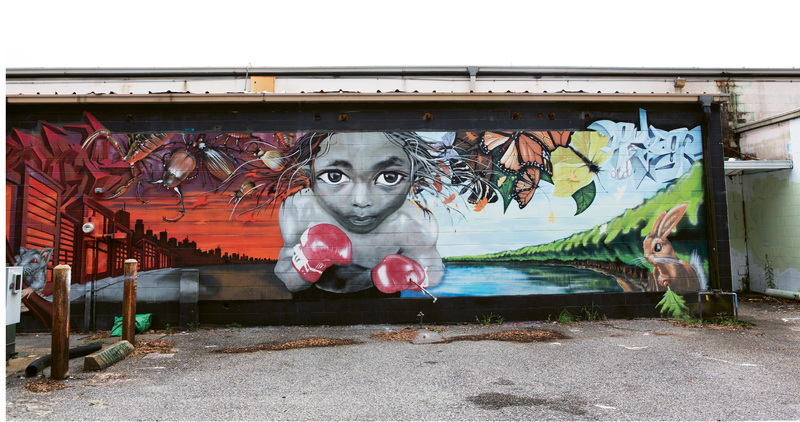 Untitled by Douglas Panzone 2012 The Sparrow (1078 E. Montague ave.) In addition to his much photographed works behind a strip mall on Folly Road, The College of Charleston Studio Art grad and former carpenter has been painting murals on commission—such as this one for the park circle tavern—full time since 2007. 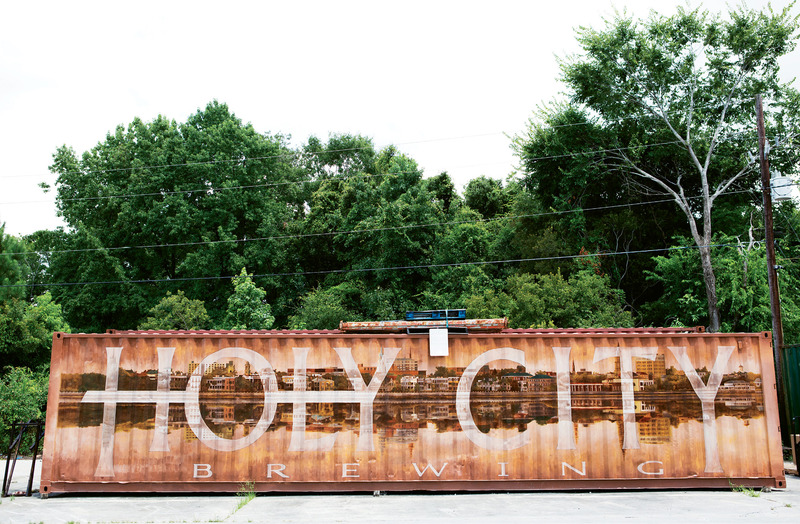 Holy City by Sean Williams 2011 Holy City Brewing (4155 Dorchester rd., North Charleston) Holy City Brewing tapped the College of Charleston studio art grad (who had welded some of their taps and made a stencil for their kegs) to create a mural relating to Charleston and incorporating their logo on a shipping container in the brewery parking lot. Williams has also painted labels for a number of their bottled and canned beers. 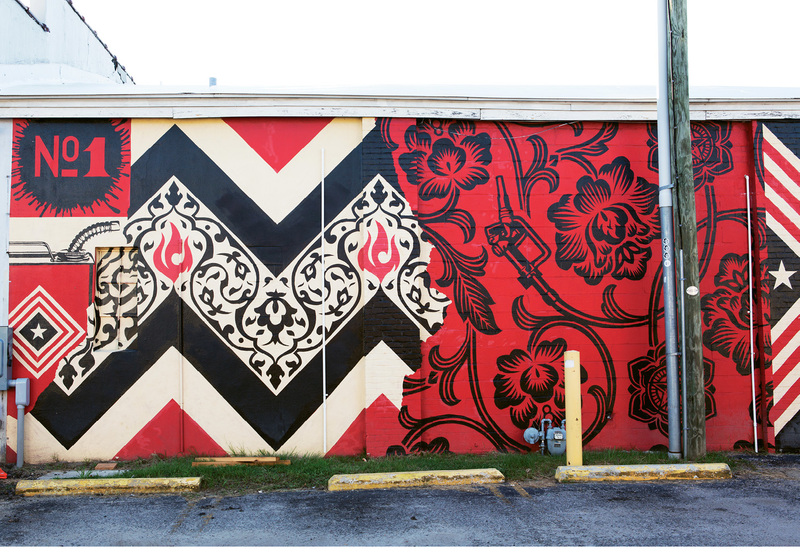 more recently the artist has been working on murals for Home Team BBQ's downtown and West Ashley locations. 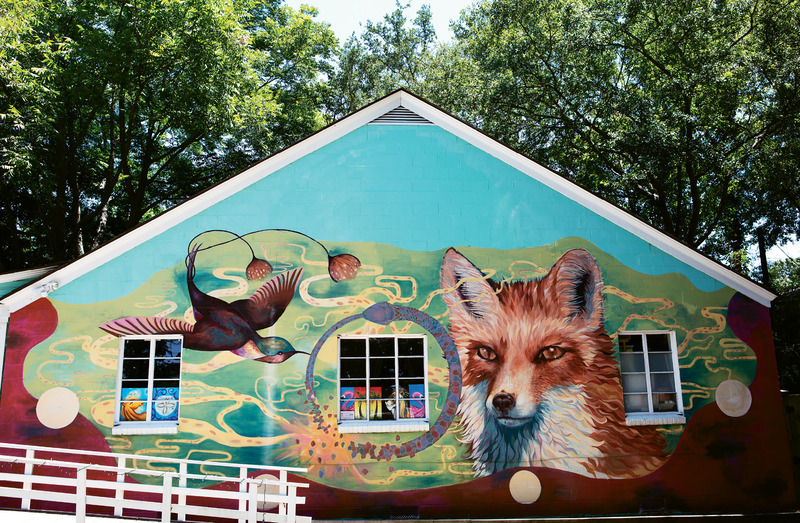 Foxcendence by Sarah Mathilda Stewart July 2014 Wine and Design (1331 Ashley River Rd., West Ashley) What could more perfectly draw the attention of motorists on busy Highway 61 toward an art school with wine tastings than An exterior wall overflowing with color and creativity? The owners hired the Charleston-based artist, who has painted a number of murals around town, including Circus Venus on Gene’s Haufbrau for avondale’s ChART Outdoor Gallery, and is currently working on a “Vaudevillian Nouveau” mural inside downtown eatery gaulart & maliclet (aka Fast and French). Untitled by Charles Desaussure 2012 Martha Lou’s Kitchen (1068 Morrison dr., Peninsula) for decades, locals and visitors alike have sought out the famous pink cinder-block building for the addictive fried chicken inside. 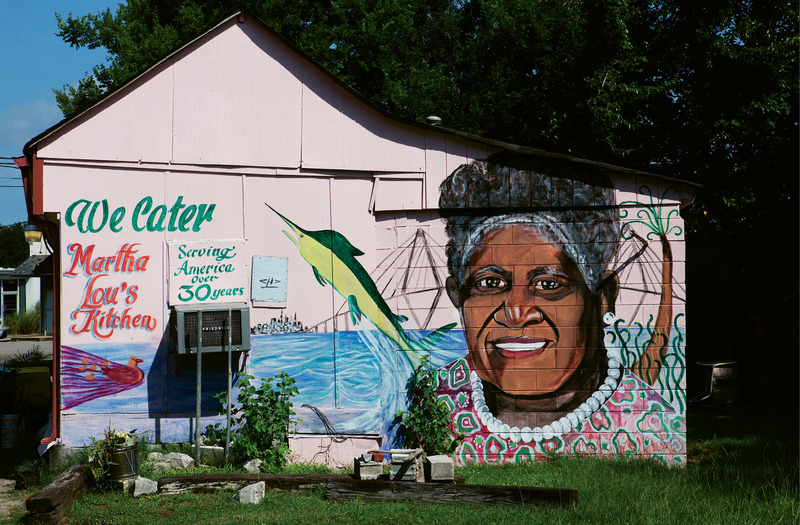 in 2012, the colorful exterior got an upgrade, an immense portrait of Martha Lou herself, painted by late Lowcountry artist Charles Desaussure, who passed away the following year. His work can be found on and in many area businesses, including Ravenel Seafood and Red Piano Too Art Gallery in St. Helena. 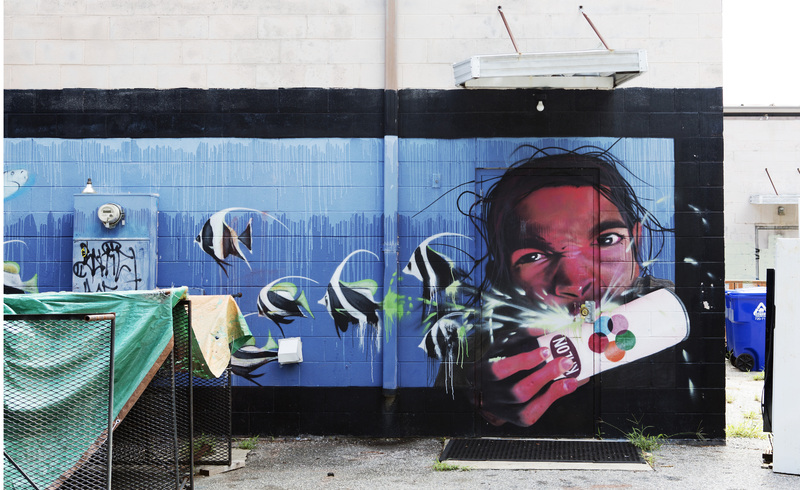 Untitled by Sergio Odeith July 2016 Moe’s Southwest Grill, (900 Houston Northcutt Blvd., Mount Pleasant) The fast-casual food franchise commissioned the renowned Portuguese painter and muralist to visually convey the company’s acronym (“Musicians, Outlaws, and Entertainers”). 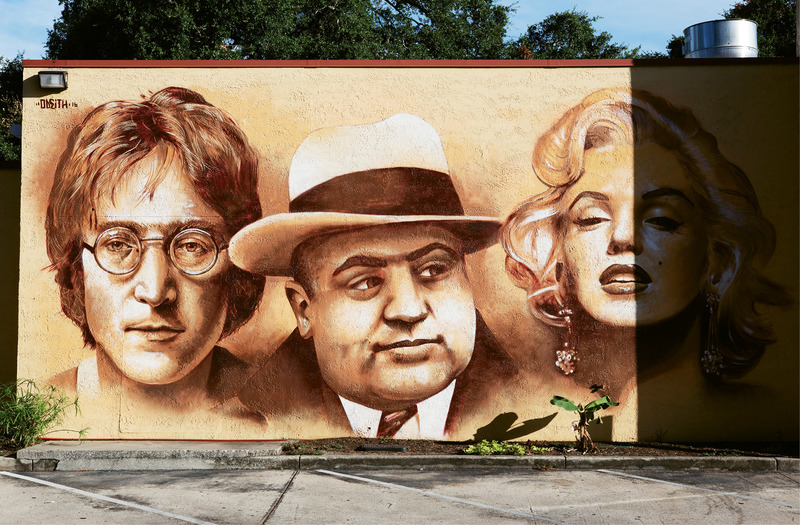 The artist, known for his anamorphic 3-D art as well as his portraiture, completed these visages of John Lennon, Al Capone, and Marilyn Monroe this summer. 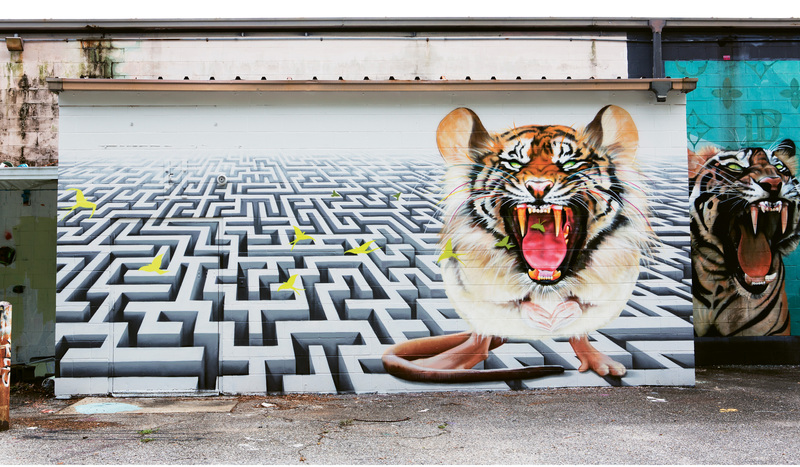 Odeith has other murals in the area, including on Huger and Hanover Streets for enough pie’s “Awakening III,” on a Hester Street residence, and indoors at the Children’s Museum of the Lowcountry.